Photos Courtesy: Harris County Sheriff’s Office, Precinct 4 Constable Mark Herman, KPRC-TV. Houston television news crews also recognized the suspect in the neighborhood this morning before Jose Gilberto Rodriguez was taken into custody. Updated July 18, 2018 — Jose Gilberto Rodriguez is being held in the Harris County Jail without bond. He made his first court appearance today. Houston Police Chief Art Acevedo is asking the public to review their surveillance video to track Jose Rodriguez’s activities before the suspect went on a violent crime spree in the Houston area. The suspect is in jail tonight and faces 2 capital murder charges and possibly more charges. According to the Harris County District Clerk Office records, 2 active capital murder complaints have been filed against Rodriguez as of tonight. Rodriguez was released under mandatory parole. His removed ankle monitor sent off an alert in early July. He is accused of killing Pamela Johnson, 62, a Kroger store employee, inside her home, Allie Barrow, 28, an employee at Mattress Firm on FM 1960 near Willowbrook Mall and Eduardo Magana, 57, an employee at a Mattress 1 One store on the North Freeway (I-45) in Houston. Their bodies were found July 13th, 14th and July 16th respectively. 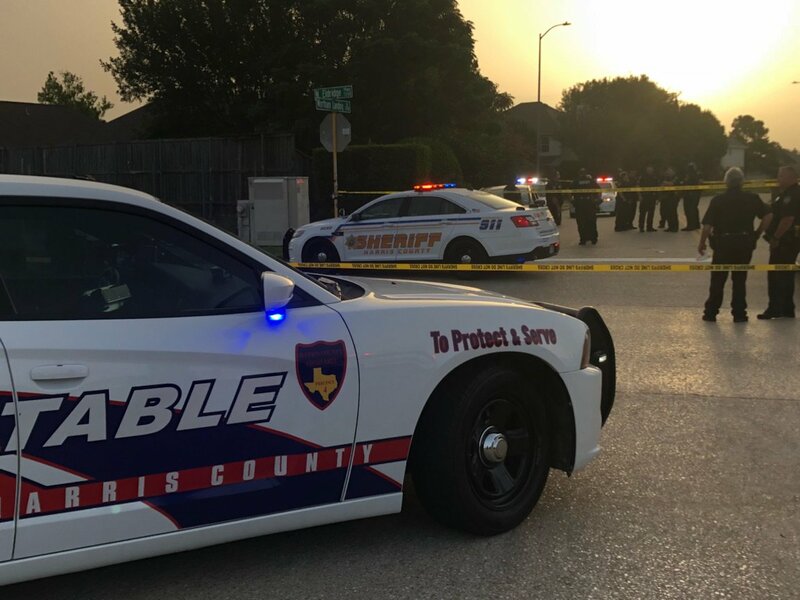 “The investigation and vehicle pursuit that led to the arrest of capital murder suspect Jose Rodriguez, 46, today was the result of great work by the Houston Police Department, along with the Harris Sheriff’s Office and other law enforcement partners. Rodriguez is suspected of killing at least three people in separate incidents in the Houston area. I extend the city’s deepest condolences to the victims’ survivors. We should never lose sight of the fact that first responders risk their lives every day to keep us safe,” Houston Mayor Sylvester Turner said in a statement early tonight. Harris County Sheriff Ed Gonzalez announced the capture of Jose Gilberto Rodriguez this morning on television. “So we’re very relieved this morning. Again, we feel he was possibly casing the area. Once again, we’re in the Cypress-Cy Fair area which he was going to frequent. It was possible he was looking for his next victim and so we’re very relieved. We’re very thankful to the citizens of Harris County, calling in, being diligent, reporting this so that we could take action. Thanks to the quick action of that citizen we were able to be involved. The deputy began searching the neighborhood. He came upon the vehicle, the vehicle we had presented to the media and he was still in the same Nissan Sentra. He was spotted at Tower Oaks and Jones. A brief pursuit began at that point that lasted about 14 minutes,” said Harris County Sheriff Ed Gonzalez. Sheriff Gonzalez said Rodriguez was taken into custody at Eldridge and Fallbrook without incident shortly before 7 a.m. today. “There was a pistol inside the vehicle. It will be processed. Everybody on the ground in Harris County. We’re very relieved,” said Sheriff Gonzalez. “Harris County Deputy Reyes made the traffic stop that ultimately led to the arrest,” said Gonzalez. As the news broke of Rodriguez’s arrest, it was confirmed on social media. 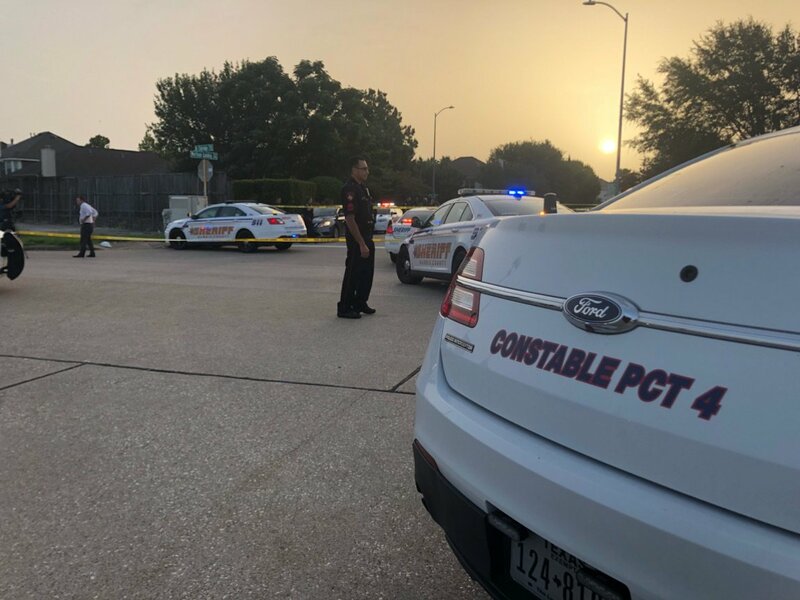 “Our Constable Deputies were involved in a police pursuit this morning with the Harris County Sheriff’s office on the wanted murder suspect Jose Gilberto Rodriguez. Suspect is in custody and there are no reported injuries to deputies. Nice work!! # Teamwork” Precinct 4 Constable Mark Herman tweeted this morning. Sheriff Gonzalez thanked everyone who helped with the crime investigations and the suspect’s capture. 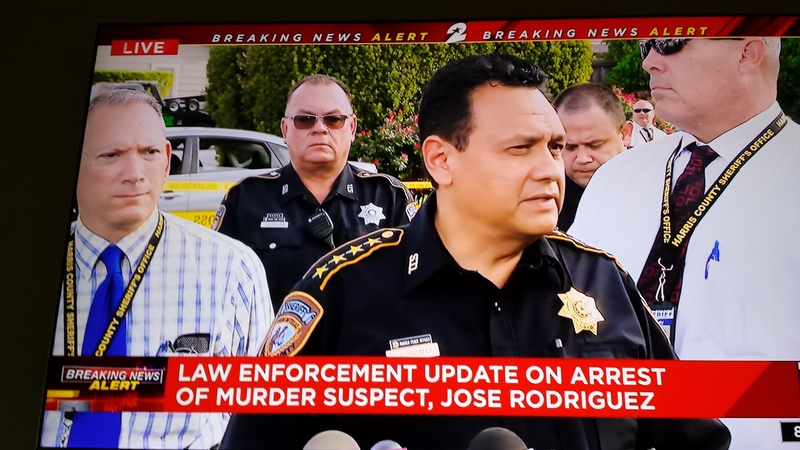 Late Monday afternoon, Harris County Sheriff Ed Gonzalez and Houston Police Chief Art Acevedo went on television to ask for the media and public’s help in finding Jose Gilberto Rodriguez,. The 46-year-old Hispanic male was wanted for at least three murders in Harris County and the City of Houston. The suspect had numerous tattoos on both arms, his neck and top of his head. 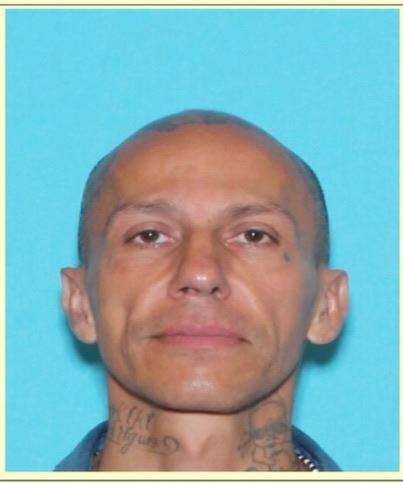 The public was warned Rodriguez, also bald, may wear baseball caps to hide the head tattoo. A law enforcement and public manhunt was underway for the crime spree suspect linked to 1 home invasion robbery, 3 murders in 4 days and 1 aggravated robbery and shooting of a Metrolift bus driver early Monday. The murders included the weekend death of 62-year-old Pamela Johnson, a beloved Kroger Grocery employee, who lived alone, in her Cypress neighborhood home. The suspect also was wanted for killing an employee at a Mattress One store and another employee at a Mattress Firm store. Harris County Sheriff’s Office released a surveillance video of Rodriguez at Willowbrook Mall on Monday morning. The suspect was known to steal the victim’s car, abandon and change cars during his crime spree in north Houston and northwest Harris County. Rodriguez was last seen driving a 2017 Nissan Sentra, dark gray in color with the Texas license plate KPD 2805 before his arrest this morning. This entry was posted in Asian Community, Asian Community Alert, Asian Community Houston, Community Alert, Harris County News, Harris County Sheriff Office News, Houston Crime News, Uncategorized and tagged Harris County Crime Spree Suspect Captured, Jose Gilberto Rodrguez Caputred in Harris County. Bookmark the permalink.